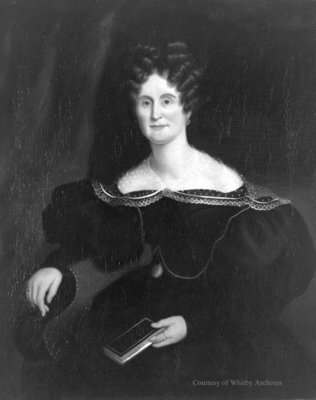 A black and white portrait painting of Mrs. Peter Perry (1795-1881). The portrait was painted by Nelson Cook at Toronto, Ontario in 1836. It is signed and dated on the back by Mr. Cook. Mr. Cook painted two portraits, one of Peter Perry and one of his wife, Mary Ham Perry. The paintings were donated to the Town of Whitby by the decedents of Peter Perry, Mr. R. L. Cowan and family of Bracebridge, Ontario in July 1972. The paintings hung in the Peter Perry home, and later the home of Mr. Perry's oldest son, Robert E. Perry. Robert took the paintings to Bracebridge when he moved there in 1871 and they remained there until 1971. When the paintings were donated they were in need of some restoration which was completed by S.A. Landymore of Ajax, Ontario. The paintings are hanging in the Whitby Centennial Building located at 416 Centre Street South, Whitby. Mrs. Peter Perry (Mary Ham) was born at Ernesttown, Lennox and Addington Counties, Upper Canada, on November 6, 1795. She and Peter Perry were married on June 19, 1814. Mr. and Mrs. Perry and their family moved to Whitby in October 1836, where Peter was one of the leading builders in Whitby. He died on August 24, 1851 at Saratoga Springs, New York, U.S.A. Mrs. Perry died at Whitby, Ontario on November 16, 1881 and is buried at Oshawa Union Cemetery.